Stephen Marvin is a writer, musician and craftsman living in Toronto. Since 1977, he has specialized in early music, performing with and leading many well known ensembles. 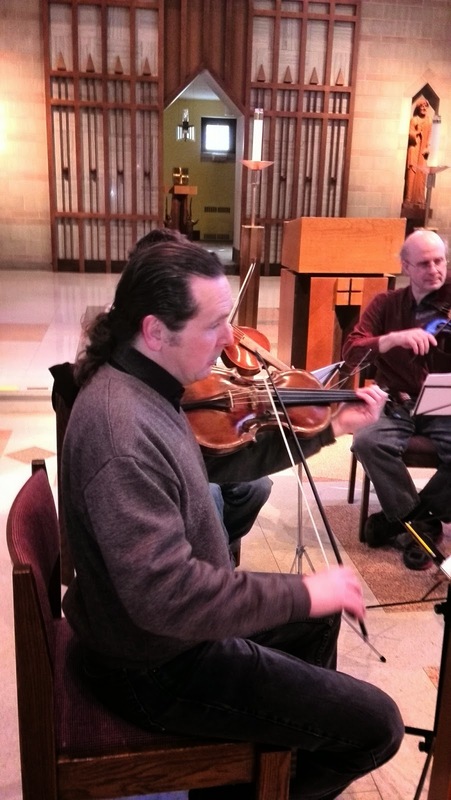 Stephen has been a principal violinist and violist with Tafelmusik Orchestra for 20 years, but now performs in about half of their season's programs. 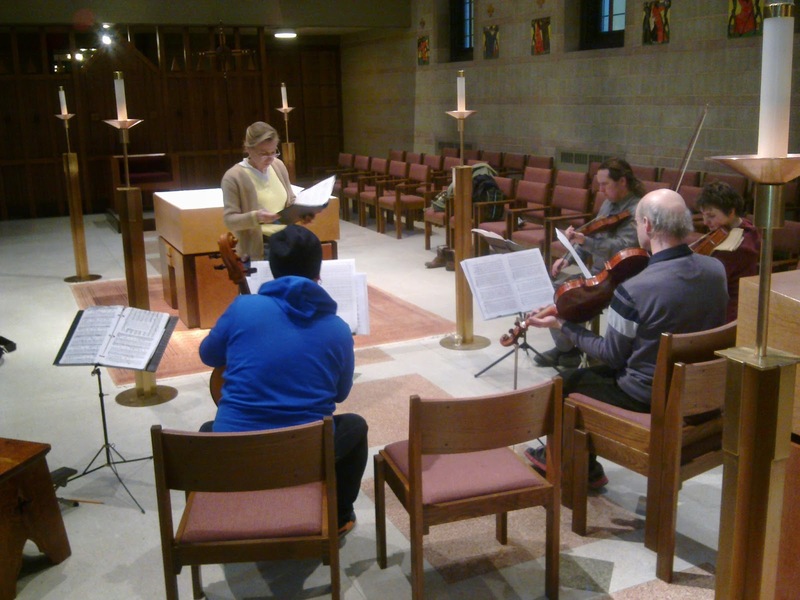 Stephen’s primary devotion to chamber music has included many ensembles, especially recitals and trio performances of late eighteenth century repertoire with fortepiano. He is the violist with the Lumiere Quartet. Stephen plays on more than 60 recordings, most notably with Sony and enjoys an international reputation as a bow-maker. For 25 years he has specialized in 17th and 18th century reproductions for early music specialists, like himself. He has published articles and given lectures on the history and construction of old bows. More recently he has begun making modern bows after examples by Tourte, Peccatte and others. Brandon Chui is Assistant Principal Viola of the Kitchener-Waterloo Symphony Orchestra and a member of the Hamilton Philharmonic. Having held leading positions in the Verbier Festival Orchestra in Switzerland and the Schleswig-Holstein Festival Orchestra in Germany, he has also performed with the Canadian Opera Company, Tafelmusik and the Toronto Symphony Orchestra. He has worked with many of today's most celebrated conductors, such as Semyon Bychkov, Valery Gergiev, Philippe Herreweghe, Paavo Jarvi, Kurt Masur, Zubin Mehta and Esa-Pekka Salonen. Extensive touring has brought Brandon to such venues as Amsterdam's Concertgebouw, Berlin's Konzerthaus and Philharmonie, L.A.'s Walt Disney Hall, Lucerne's KKL, Zurich's Tonhalle and the opera houses of Genoa, Lyon and Versailles. 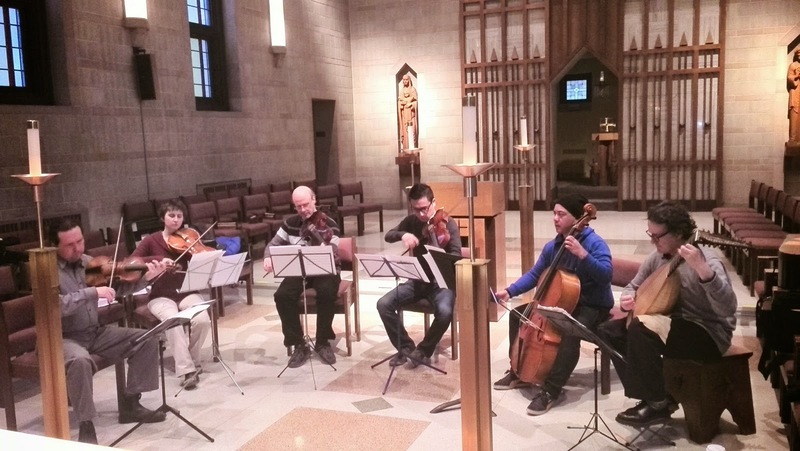 As well as being a founding member of I Furiosi Baroque Ensemble, baroque cellist and viola da gambist Felix Deak showcases his career as a freelance musician with orchestras and chamber ensembles, including Toronto's Tafelmusik Baroque Orchestra, Toronto Symphony Orchestra, Les Voix Humaines and Opera Atelier. Felix instructs orchestral classes and private students in and around Toronto. He can be heard on CBC Radio Two in performances, and has made recordings for various labels at home and abroad. The Reverend Lisa Wang holds degrees from the State University of New York (BA), the University of Toronto (MA, MDiv), and the University of London (PhD). She has published in the areas of literature and theology, ecclesiology, and Biblical interpretation. She currently teaches at the Faculty of Divinity, Trinity College, and serves at the Anglican Church of St. Mary Magdelene, Toronto. 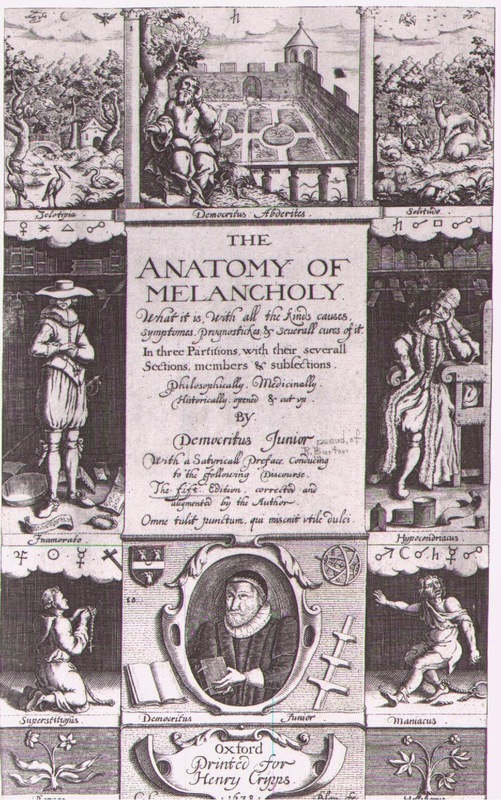 In his Anatomy of Melancholy (first published 1621) The Second Partition, (on the Cures of Melancholy), Section 2, Subsection 3, Member 1, the thorough Robert Burton treats of the efficacy of ‘Music of all Sorts, aptly applied.’ Let’s see what the windy Burton, who loved to express himself in quotes from Ancients and Moderns and everyone between, has to say. Scaliger gives a reason of these effects, “because the spirits about the heart take in that trembling and dancing air into the body, and are moved together, and stirred up with it,” or else the mind, as some suppose harmonically composed, is roused up at the tunes of music. And 'tis not only men that are so affected, but almost all other creatures. Many men are melancholy by hearing music, but it is a pleasing melancholy that it causeth; and therefore to such as are discontent, in woe, fear, sorrow, or dejected, it is a most present remedy: it expels cares, alters their grieved minds, and easeth in an instant. In 1596 John Dowland had been kicking around the continent of Europe in a series of unsatisfactory court jobs when he received a letter from his friend the courtier Sir Henry Noel. The letter urged him to hurry back to England as Sir Henry thought he had scored him a job at Queen Elizabeth’s court. When he got back though, Dowland found his patron Noel had died, and with him his job. Dowland dedicated to Noel a manuscript collection of penitential Psalms and hymns from the standard Psalter used in England at the time which appear at first glance to be standard settings of hymn tunes, but which have fidgety rhythms and fleeting dissonance that betray the composer. And so, Dowland ended up back on the Continent working for Christian IV, King of Denmark where his routine seems to have been get an advance on his salary, sail back to England and get something published to keep him in the public eye, sail back and apologize for overstaying, repeat. On one such trip he had printed Lachrimæ or seaven teares figured in seaven passionate pavans set foorth for the lute, viols, or violons, in five parts. The seven pavans (the pavan was a slow dance in three repeated parts of eight measures each, but no one could have danced to these ones) which begin the collection start with has come to be called the Lachrimae motto. The piece which is called Lachrimae antiquae (Latin for Old Tears) is a re-writing of a pavan that was originally for lute solo which is found in almost all British sources of lute solos and many continental ones from the 1590s to the 1630s and beyond. This lute mega-hit had words written to it beginning ‘Flow my teares’ printed in 1600 in Dowland’s Second Book of Songs. 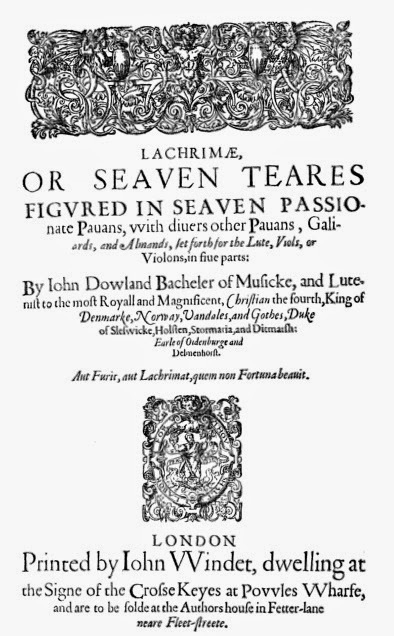 Each of the Lachrimæ or seaven teares pavans takes the first few notes of the original as its point of departure and then wanders off, respectively through Old New Tears (Lachrimae antiquae novae), Sighing Tears (Lachrimae gementes), Sad Tears (Lachrimae tristes), Forced Tears (Lachrimae coactae), Lover’s Tears (Lachrimae amantis) and True Tears (Lachrimae verae). The Lachrimæ or seaven teares print was dedicated to the consort of the new English King James, Anne, who happened to be the sister of the King of Denmark. A job back home was not forthcoming however and Dowland was let go from the Danish court by civil servants fed up with his attendance record. (Christian was away at the time.) 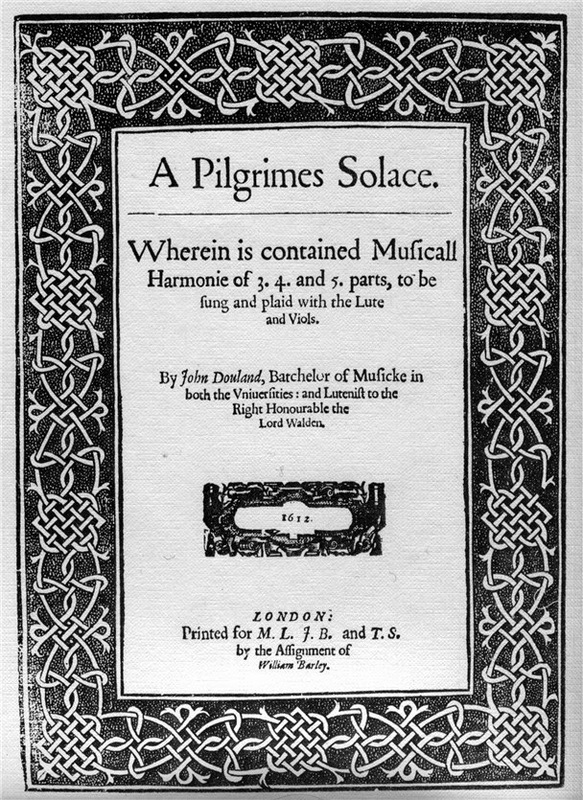 In 1612 the fore mentioned A Pilgrimes Solace was published, dedicated to his then employer, who was much too minor a nobleman for the greatest lutenist in Europe and the greatest songwriter in the English language (then, and, we would argue, still and ever). Probably Dowland’s grumpy preface to the book, which complains about ‘strange entertainment’ at court, and the ‘fellows who give their verdict of me behind my back’, shamed the Jacobean court into giving him a place as a lutenist there which had been empty for decades. It’s from A Pilgrimes Solace that most of the remaining ayres heard tonight are taken. Timothy Bright, in his Treatise of Melancholy, gives us some symptoms. 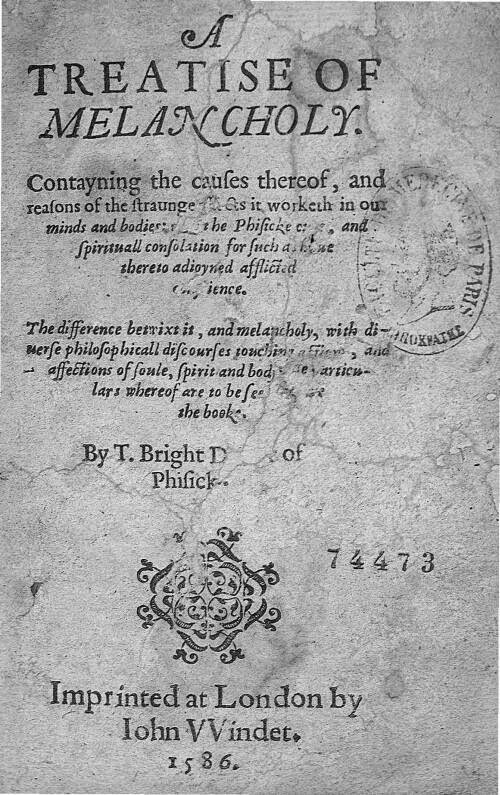 They will be ‘Given to weeping sometimes (if the melancholy be sanguine, they exceed in laughter) sighing, sobbing, lamentation, countenance demisse (downcast), and lowring, bashfulnesse, and blushing.’ The melancholy poet of If that a sinner’s sighes ticks many of those boxes. Dowland borrows the Italian madrigalists’ trick of writing a rest for the singer at the word ‘sigh’ to imitated the physical reaction of black bile (melancholy) expelling air from the body. The composer borrows yet more Italianisms in the adventurous harmonies deployed in Thou mighty God and In this trembling shadow. In his First Book of Songs Dowland had proudly printed a rather lukewarm commendation by Luca Marenzio, a pioneer of the Mannerist Madrigalists who deployed dissonance to paint the pains of lovers. The most extreme of these composers was Gesualdo, a mad nobleman, and Dowland certainly rivals his expressionistic harmonies here. Despair, it is held, is a sin. 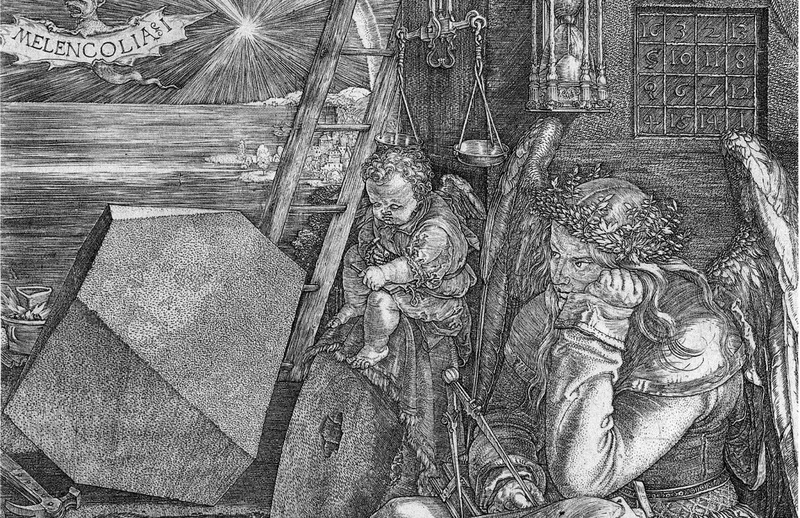 Dowland’s Second Book of Songs makes Songs of Leonard Cohen seem jaunty by comparison, both musically and in its verse. The third song of that book is for one voice and lute, and begins Sorrow stay. The manuscript consort song version you hear this evening gives a variant on the original text, which ends ‘Down, down down I fall/Down and arise I never shall.’ but for the religiously scrupulous the manuscript provides another more extensively rewritten text, which ends, through hope of Jesus’s intercession, with the singer ‘never falling’. In a word, it (music) is so powerful a thing that it ravisheth the soul, regina sensuum, the queen of the senses, by sweet pleasure (which is a happy cure), and corporal tunes pacify our incorporeal soul, sine ore loquens, dominatum in animam exercet, and carries it beyond itself, helps, elevates, extends it.